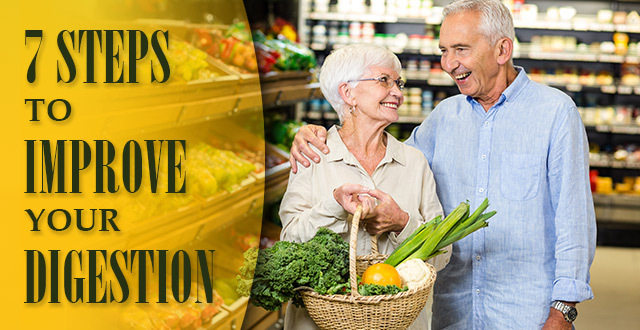 We’re all aware of the fact that aging not only comes with a bunch of extra cleverness, but also with several health changes, including the way that one’s digestive processes are functioning. Medical statistics show that almost 40% of mature adults are struggling with at least one digestive symptom associated with aging each year. Read below about the steps that can help improve your bowel movements as you celebrate more and more anniversaries. Also, find out what main digestive issues you may experience and how to manage them. As we age, our body begins to change in terms of its ability to digest food. A variety of factors, from drug treatments for various ailments, to sedentary lifestyle and dental diseases have an important impact on our digestive health. These factors’ consequences are indigestion, constipation, diverticulitis or ulcers. Bowel movements are slower after we overcome middle age, which means that constipation could become a constant problem. The digestive tract leads food to the colon by using muscle contractions, which tend to become weaker over time. This slowed process favors a high dehydration of the digestive waste, which are removed with more difficulty. Almost 50% of the population over 60 years old is suffering from diverticulitis, a condition characterized by the appearance of mucus pockets (out-pocketing of the colonic mucosa and submucosa known as diverticula) and eliminated through the colon wall. The main symptoms of the disease are cramps, bloating and constipation. Mature adult age is a risk factor for diverticulosis. When diverticula become inflamed, the condition becomes diverticulitis, and it can possibly trigger abdominal pain, cramping, fever, chills, nausea and vomiting. The esophagus is the tube that connects the mouth and stomach. Like the colon, it begins to run slower at wiser ages, causing difficulty in swallowing solid food and liquids. The risk of developing colon polyps increases markedly once we cross an age threshold. Their causes are unknown and their nature can be non-cancerous, potentially cancerous or cancerous. Doctors believe that these growths are influenced by diet and genetic predisposition. Routine colonoscopy helps track these polyps. Aging means, among other things, the loss of the body’s ability to use water properly, therefore, an increased predisposition to dehydration. A high intake of liquids (plain water, natural fruit juices, and soups) will help prevent constipation and other age-related digestive disorders. Water in combination with dietary fiber is a powerful combination, stimulating the feces elimination. Liquids containing caffeine, such as coffee or tea, may cause dehydration, so should be consumed in moderation. It’s easy to understand why diet plays a key role in maintaining our digestive system’s health. The excessive consumption of high calorie foods leads to weight gain, a sedentary lifestyle, and the predisposition to gastric hyper-acidity or indigestion. Nutritionists recommend us to exclude fatty meals, processed foods, sweets and large servings from our daily diet. We should eat small and frequent meals, which spare the digestive system and helps it work properly. Dietary fiber from fruits, vegetables, whole grains and oleaginous fruits is essential to the functionality of our digestion, especially at mature ages. They cleanse the digestive system, induce a feeling of satiety and prevent excess eating. Make sure that your fiber intake is accompanied by an intense hydration of the body. Lack of exercise is among the leading causes of constipation, therefore another important step in improving our digestion is having an active lifestyle. Regular aerobic exercise, such as walking, cycling, swimming and dancing are excellent choices for this purpose. An exercising routine has proved to be a good protector of the digestive and cardiovascular systems, and also very efficient in preventing high blood pressure and heart disease. Physical activity helps us maintain a normal body weight, which is essential for a healthy digestive system. Stress directly affects our digestive health, increasing the risk of developing stomach acid, ulcers and irritable bowel syndrome. Relaxation techniques such as meditation or yoga can be helpful in combating stress together with a healthy schedule of rest and plenty of exercise, which stimulates the production of endorphins (the hormone that induces a pleasant state of relaxation). A healthy digestive system starts with proper oral care. The functional dentition is essential for mastication. Many of us are suffering from indigestion just because we aren’t able to chew properly. A visit to the dentist may be the first step towards a more beautiful smile, but also to an improved digestive health. We can all agree these steps are pretty easy put into practice. Improving our digestion is not mission impossible and we can certainly notice results in a timely manner. Delia is a creative writer with a special interest in crafting meaningful content for the mature adult. Besides her daily awesome job, she likes to travel, listen to music and spend time with her dear ones.